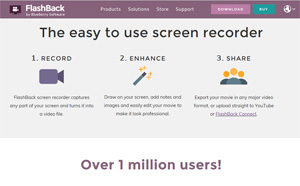 Blueberry produced a screen recorder software product for sale via the internet. In addition to developing the program, Blueberry created the online store and marketed the product. In 2002, computer screen recording was still a relatively novel idea with limited uses. At the time, there were few screen recorders available, and none capable of making lossless high quality recordings with small file sizes. Blueberry Consultants recognised their emerging potential for creating software demonstrations, tutorials or communicating information about PC problems, and made the decision to develop a high quality application to address the gap in the market. Blueberry’s screen recorder would be designed to offer superior quality and file size to existing software, and would be distributed to a mass-market using Blueberry’s in-house technical and commercial expertise. The product had to support multiple versions of Windows and many different hardware configurations. It needed to handle being installed by an administrator and run by a user with limited access rights – a common situation in many companies. Upgrades and updates had to be planned for, including a “check for updates” function to make the process as simple as possible for end-users. Thorough testing of the software would be crucial to ensure reliability. The design of an online store, complete with order processing system. The payment system would need to be a bespoke design that included order processing for purchase via credit card or purchase order. Web page optimisation would be critical to ensure the site would rank well on search engines for key phrases. Comprehensive Help text had to be written as part of an end-user manual. A responsive customer support system was required for order and technical queries. Marketing and promotion of the software to ensure awareness of the product. FlashBack screen recorder was developed in Borland C++ Builder. To achieve lossless quality recordings at high frames-per-second while keeping file sizes small, Blueberry used a ‘mirror driver’ to catch all the changes written to the screen by Windows. This was one of the more technically challenging parts of the project, because although mirror drivers are a powerful feature of Windows, they are not well documented. The successful implementation of the driver was crucial in giving FlashBack a performance advantage over competing screen recorders. After successful completion of the project, a new sister company – Blueberry Software Limited – was founded to handle the sales, support and future development of FlashBack. Blueberry Software’s website has been designed for ease of navigation and optimised to rank high on search engines. 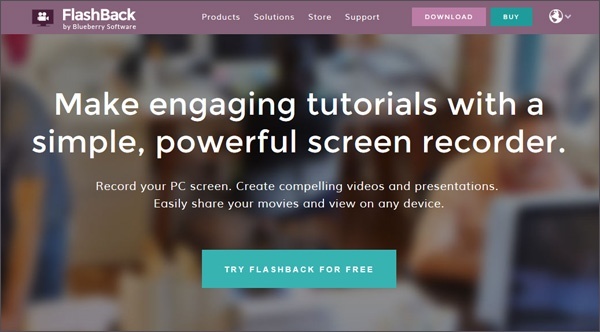 Since its release in 2003, FlashBack has undergone continuous development to keep pace with new technology and the changing needs of users. It has now grown into a family of screen recorder products covering a wider range of price points – including a more specialised application, TestAssistant, aimed at the software testing market.